With the colder weather here, I have really been craving chicken pot pie. I don't know why, I am normally not a big meat in pie form eater. However, right now chicken pot pie kept popping into my hunger brain. I hadn't made a chicken pot pie since Hubby and I were first married and I was wooing him with some of his favorite dishes...dishes there aren't on my list of favorites...like shepherd's pie, homemade hamburger helper, the list goes on of casserole type dishes. So basically, I had no go-to recipe for chicken pot pie. I did some searching and landed on the idea of making personal sized pies with just a little crust. After finding several ideas I landed on this recipe from one of my favorite "I-wish-I-were-her" sites--Everyday Occasions by Jenny Steffens Hobick. Her recipe is really easy to follow and I only had to make a few minor adjustments for our family. The Little Men, well with exception of Littlest who eats NOTHING, ate it up. Hubby LOVED it. I will be honest and say that I liked it, but my mental desire for chicken pot pie and my actual appetite for them didn't match up, so I didn't love it. 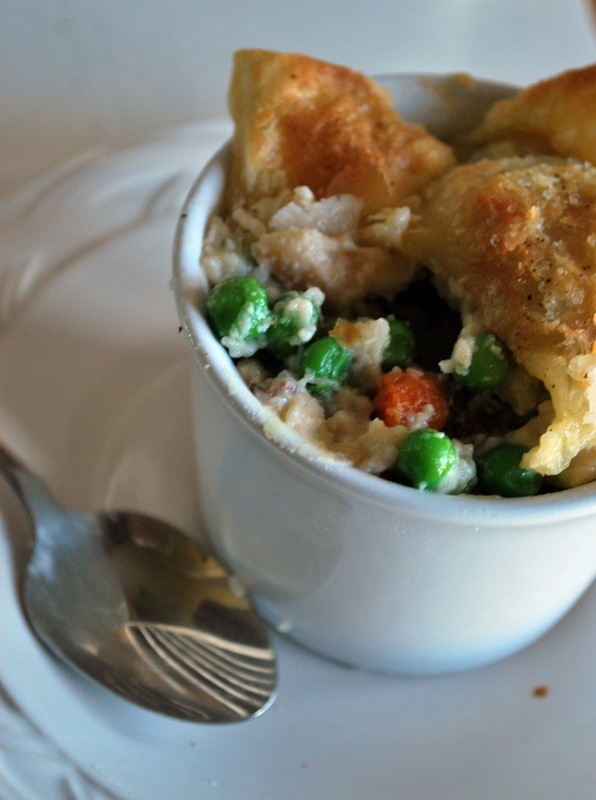 HOWEVER, for chicken pot pie lovers, this is a great simple recipe. Totally kid friendly too. Preheat your oven to 425 degrees. To roast chicken and vegetables, place the chicken breast in the center of a baking sheet. Add the carrots on one side and the potatoes on the other. Drizzle the vegetables and chicken with olive oil, salt and pepper. Toss the carrots and potatoes to coat. Roast them in the oven for 20-30 minutes depending on the thickness of the chicken breast. While chicken and vegetable are roasting, start making the cream sauce. I would recommend having all the sauce ingredients pre-measured and ready to go. In a saucepan, melt butter on medium-low heat then stir in flour, whisking until smooth. Let the flour and butter cook for about 1 minute. Whisk in chicken stock and continue to whisk over low heat until smooth. Add in the half-and-half. Whisk until smooth. Cook over medium-low heat for 5-7minutes until thick and bubbly - whisk constantly, or at lease every minute to keep it from burning on the bottom. When it is thick, turn off the heat. When chicken and vegetables are done roasting, let them cool a couple of minutes and then cut chicken into bite-sized pieces. Add the chicken, potatoes, and carrots to the cream sauce. Stir to coat. Then add the peas, the sauce should still be warm enough to thaw the peas. Scoop the mixture into 4-6 oven safe ramekins. 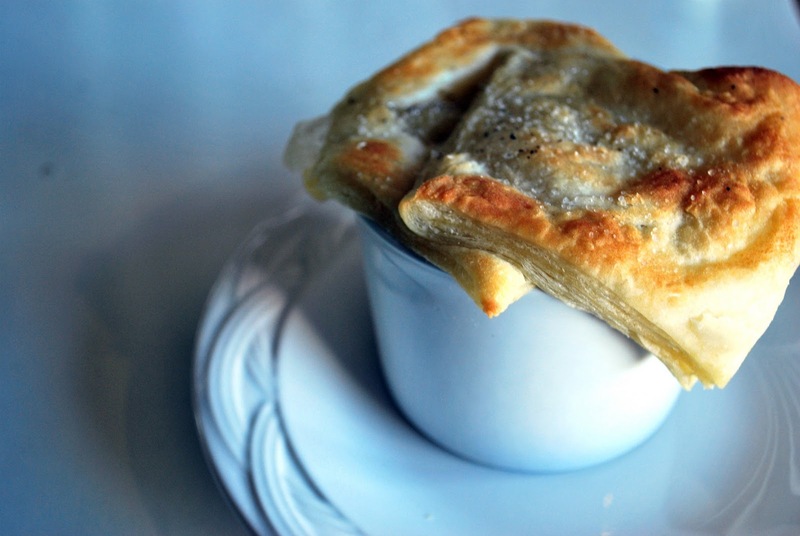 Take the sheet of puff pastry and cut into enough squares for 2 per ramekin. Place two pieces on the top of each ramekin, covering the chicken mixture. Repeat for each ramekin. Brush the tops with melted butter and sprinkle with salt and pepper. Then place them under the broiler for 2-3 minutes, until puffed and golden brown. After the broiling step, I actually put mine back in the oven at 350 for 5-10 minutes to make sure my pot pies were warm all the way through. Perfect for a cold and chilly day. Plus, aren't they so pretty??? I'm guessing the second ingredient is carrots? So far, I have loved all of your recipes I have tried. I'm taking the honey lime enchiladas on Monday to a mom in our MOMS Club that just had a new baby. I wonder if you could make these pies in a mug, as I don't have big ramekins (only creme brulee size). Yep, that should read carrots...does now! As long as the mugs are oven proof that is a great idea! hmmm. could these cravings have anything to do with the extra person you are taking care of?? ?